From ancient Roman springtime fertility rites to Christian celebrations of resurrection and renewal, the seasonal celebrations of Easter have always been a special time in Italy. During Lent, Italians look forward to the sweet treats that they have supposed to have abstained from during the 40 days of lent and the fast is broken on Easter day with a traditional family meal of roast lamb. Well before the arrival of the actual event there are Easter displays in bakeries, bars and shops and they centre on brightly wrapped and elaborately decorated gift filled Easter eggs ranging from modest to absolutely enormous. Apart from these widely recognisable symbols of Easter there are other treats to be had. Depending on where you come from these Italian Easter specialities could be the Umbrian “Torta di Formaggio” a truly delicious cheesy bread, a rosemary scented Florentine Easter bun called Pan di Ramerino or the traditional Colomba di Pasqua. The latter is a sweet, eggy, yeasted bread similar to the Christmas panettone without the raisins and with the addition of candied orange peel and a sugary almond sprinkled crust. 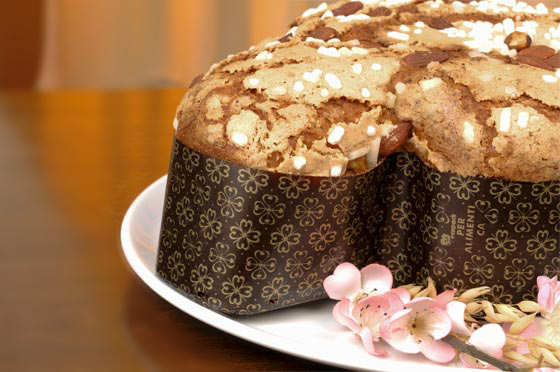 This light and fragrant cake is supposedly shaped like a colomba or dove; one of the most recognisable Easter symbols of Easter. Though the cake was popularised in the early 1900s by the Milanese confectionery company "Motta", the tradition is said to go back to the 12th century when two doves appeared over the city of Milan after the defeat of the Emperor Fredrick Barbarossa. The cake apparently commemorates the event and the victory that took place. The second, slightly less savoury version tells that the cake derives from Pavia, a city near Milan. During the time when Lombard king Alboin conquered the city it is said that he took precious jewels and a number of girls to do with as he pleased. Most of the unlucky maidens were understandably hysterical but one plucky girl, when called to his room, took along a delicious sweet bread in the shape of a dove, made with eggs, candied fruit, yeast, sugar and flour. Apparently Alboin was pleased with her gift and set her free. Whatever the truth is the cake is well worth a try and makes a change from chocolate! A chocolate-y time of year!